Jimmy McCombie says: "Second fae the right (squatting), Jimmy McCombie 1958"...and what a fine young RAF loon! Photograph taken at RAF Bridgnorth, Shropshire. RAF Bridgnorth was a Royal Air Force Station, created on 6 November 1939, at Stanmore, to the East of Bridgnorth, Shropshire, England. The first unit stationed there was No.4 Recruit Centre. 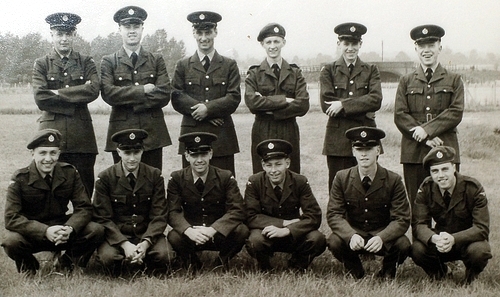 Their role was to carry out the basic training of new recruits in the RAF. In 1940 spare accommodation at Bridgnorth enabled it to be used as a transit and kitting out centre for troops returning from France. In 1941 the Station was renamed No.1 Women’s Auxiliary Air Force Depot involved with the training of W.A.A.F. recruits. 1942 saw another change of name to the No.1 Elementary Air Navigation School.Only after the war ended in 1945 could the Station revert to its original task of providing basic training to recruits, as the No.7 School of Recruit Training. Tens of thousands of recruits passed through Bridgnorth for their initial eight weeks training or ‘square bashing’ as it was called. Very few remained unaffected by the experience and many, even sixty years later, remember it well. For many it was their first time away from home and it became their first step into the wide world. Former recruits and Permanent Staff are now found scattered throughout the world. The Station closed on Friday 8 February 1963.